Come and enjoy a strawberry shortcake made right before your eyes with poundcake, strawberries, vanilla ice cream and whipped cream. 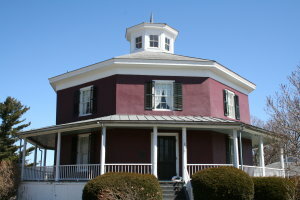 Sit under a tent on the front lawn of our beautiful 1856 Octagon House. When you are done, take a self tour through the house with docents ready to answer any questions you may have. Shortcakes are reasonably priced and fathers accompanied with children are FREE.